Oconee County Commissioner Chuck Horton tried last night to get Commission Chairman Melvin Davis to engage in a conversation about a recent proposal before the Policy Council of the Association County Commissioners of Georgia that would have altered how counties change the powers of the chairman. While Horton was speaking, Davis shuffled papers on his desk, looked down, and at one point even turned his back briefly on Horton, the other commissioners and the public. Horton asked Davis to explain his role in creation of the ACCG document. Davis parried. The Policy Council pulled the provision from the 2010 County Platform document after that discussion. Davis will assume the presidency of ACCG in late April or early May, at the annual conference of ACCG. Horton had put the ACCG proposal on the agenda for last night’s meeting and began by saying he was surprised a couple of weeks ago when someone tipped him off to the proposed change. He said he and commissioners John Daniell, Margaret Hale and Jim Luke immediately registered their objections. In August of 2009, the BOC passed an ordinance that changed the organizational chart for Oconee County. The new chart has Administrative Officer Alan Theriault and Finance Director Jeff Benko reporting to the full five-member board, rather than only to the chairman, as had been true in the past. Davis objected to the change, which passed with the support of the other four commission members. Horton said he thinks the proposed ACCG policy, which would give the state legislature more control over changes in local government structure, is at odds with what was done locally. “If you knew about this and had anything to do with it and didn’t notify us, I find that disturbing,” Horton said to Davis. Davis busied himself with his paper shuffling until Horton stopped speaking. Commissioner John Daniell said he thought the Policy Council did the right thing in striking the provision. The other two commissioners did not speak. County Attorney Daniel Haygood said his interpretation of the proposed change is that it would not affect Oconee County under any circumstance. The proposal was under the heading “Home Rule: Changing Duties of the Chairman” and followed another item in the document called “Districting: Home Rule.” Both are on page 14 of the document. Haygood said he interpreted the provision as applying only to a Home Rule provision of the state constitution, though the document itself does not specify that, and both sections with the “Home Rule” title deal with general issues of local governance. The “Changing Duties of the Chairman” provision said that the state legislature should pass legislation to stipulate that any changes to the duties of the chairman could not be made until a new chairman is elected, that one or more public hearings had to be held before the changes could take place, and that changes had to be approved by a vote of the citizenry that had been authorized by the state General Assembly. Davis looked at Haygood and nodded in agreement as Haygood made his argument that the provision was more limited than Horton and Daniell stated. Haygood said Oconee County last year had merely specified powers of the chairman and the Board that had not been specified in the past. The whole exchange last night on the ACCG proposal took 8 minutes and 20 seconds and came late in the two-hour long meeting. Earlier the commissioners gave a weak endorsement to an invitation from the Northeast Georgia Regional Commission that Oconee join with NEGRC to create a Local Agriculture Protection Guide. County Strategic and Long-Range Planning Director Wayne Provost lead a discussion of the request, which was supported strongly by local farm protection advocate Russ Page. The Board expressed reservations about joining with NEGRC on the project out of fear it might lead to some restrictions on what the county does to promote development in the county in the future. In the end, the vote was unanimous to make application, though Provost was told to come back to the Board if he felt any of the provisions were becoming onerous. The Board also gave the first reading to an ethics ordinance and put it on the agenda for its next meeting, which is scheduled for Oct. 12. I was the only person who offered public comment on the proposed ordinance. I asked Haygood if a person filing an ethics complaint against a commissioner would have protection against being sued for libel or slander as a result of the action. This protection exists for a person filing a suit in court. Haygood said it is his belief that the complainant would not have such protection. And journalists or citizens who wrote about the complaint also would not have the usual protection against libel that exists when they write about court documents and proceedings. The BOC also reviewed and tentatively approved new bylaws for Keep Oconee County Beautiful Commission. The bylaws specify that the Keep Oconee County Beautiful Commission will work with a county department to prepare a budget for presentation to the BOC. Esther Porter, executive director of KOCBC, had asked earlier that the organization be allowed create its own budget request and bring it to the BOC. At present, KOCBC is housed in the Public Works Department. The BOC put the bylaws on the consent agenda for the Oct. 12 meeting, meaning they will be approved without comment unless a commissioner asks that they be brought off the consent agenda for further discussion. With considerable enthusiasm, the Board put on the consent agenda the alcohol license application of Trader Joe’s, to be located at 1850 Epps Bridge Parkway. “Don’t run out of stock,” Horton told Philip Wofford, who represented Trading Joe’s at the meeting. The Oconee County Board of Commissioners is scheduled to take up at its agenda-setting meeting tomorrow night a proposal that was pulled from the platform of the Association County Commissioners Georgia on Sept. 20 and that would make it harder for county governments to change the duties of the board chairman in the future. Horton joined Oconee County commissioners John Daniell, Margaret Hale and Jim Luke in asking the Policy Council of ACCG to remove the proposal from it platform, and the Council did so. In a paragraph headed “Home Rule: Changing Duties of the Chairman,” the proposed ACCG county platform said that the state legislature should pass legislation to stipulate that any changes to the duties of the chairman could not be made until a new chairman is elected, that one or more public hearings had to be held before the changes could take place, and that changes had to be approved by a vote of the citizenry that had been authorized by the state General Assembly. 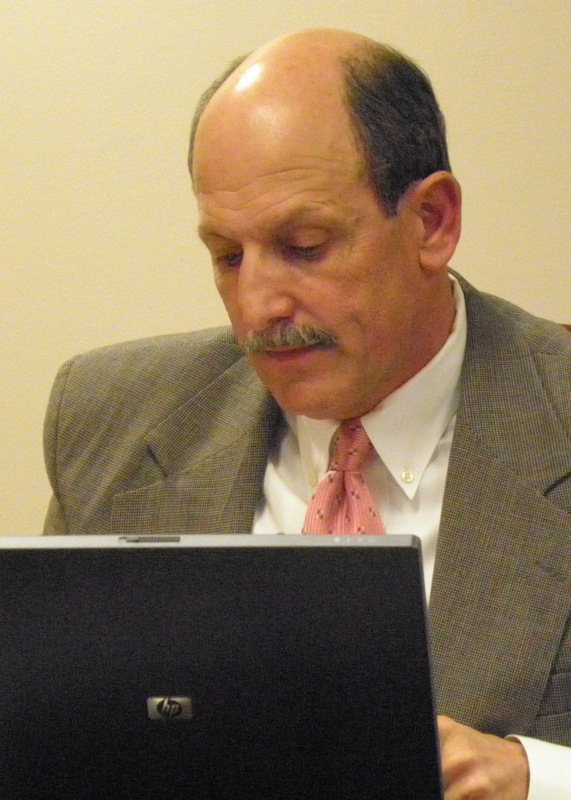 The Oconee County BOC changed the county’s organizational chart in August of 2009 so that County Administrative Officer Alan Theriault and Budget Director Jeff Benko report to the full board, rather than only to Davis, as had been true in the past. In the new chart, all other department heads report to Theriault, rather than to Davis. The BOC had not approved the organizational chart that existed before the change, and it is not a part of the enabling legislation for the county. Davis opposed the changes, which were approved unanimously by the other four members of the Commission. ACCG President Lamar Paris and General County Government Policy Committee Chairman Roger Boatright will name a committee to further discuss the issue, and it could come up again in the future, according to Beth Brown, ACCG director of communications. Horton (right) said he wants to talk about what happened and about the implication of the ACCG platform for the county. Both The Oconee Enterprise and the Athens Banner-Herald have written about the Macon meeting, focusing on the disagreement of Daniell, Hale, Horton and Luke with the proposal. Neither of the papers indicated exactly how the proposed change got into the draft of the ACCG County Platform. Brown told me in a telephone conversation today that the proposed policy change came from the General County Government Committee of ACCG and was joined with recommendations from the five other committees to form the ACCG County Platform. Oconee County Board of Commissioners Chairman is a member of the General County Government Committee. Brown told me she didn’t know where within the committee the proposed change originated. Erin France was the author of the story today in the Banner-Herald about the ACCG proposal. If Davis told her the answer to my question, she didn’t report it today. Davis also is chairman of the Policy Council, though Brown sent me an email message saying that Davis “left the room during the discussion of the entire General County Government section” of the Platform. Hale also is a member of the General County Government Committee, but she told me tonight she did not attend the last meeting of that group in Savannah in April and learned of the proposed change only just before the Sept. 20 Policy Council meeting in Macon. The agenda for the meeting tomorrow night, which will begin at 7 p.m. at the county courthouse, contains a number of other interesting items. The county is scheduled to take up an invitation from the Northeast Georgia Regional Commission that the county join with NEGRC to create a Local Agriculture Protection Guide. Oconee County has a farmland protection program and has set aside money in the current Special Purpose Local Option Sales Tax to fund it. County Strategic and Long-Range Planning Director Wayne Provost will lead the discussion of the NEGRC solicitation. In addition, the BOC is scheduled to give first reading to a proposed County Commissioner Ethics Ordinance. It also will discuss revised by-laws for the Keep Oconee County Beautiful Commission, which has asked the county to remove it from the Public Works Department and let it report directly to the BOC. It also will review two in what has become a long list of alcohol license applications. One of those to be reviewed tomorrow night comes from AA Trading Group on Macon highway. The other comes from Trader Joe’s on Epps Bridge parkway. Part of the suspense for the latter is whether “Two Buck Chuck Wine” will be offered. Some Trader Joe’s stores around the country offer a bottle of Charles Shaw wine for as low as $1.99. The Oconee County Board of Commissioners is scheduled to give first reading on Sept. 28 to an ethics ordinance, revised since it was first proposed back in April to decrease the influence of the BOC on appointment of an Ad Hoc Board of Ethics to hear ethics complaints against commissioners. The ordinance sets forth general ethical standards for county commissioners and specifies behaviors that are prohibited in 19 separate categories. The ordinance stipulates that commissioners shall not have an interest in any contracts or transactions affected by their actions, attempt to influence a county officer making country purchases, withhold information from county boards or departments, or make unauthorized use of county property. Any commissioner with an interest in any proposed ordinance, resolution or other action before the board of commissioners is required to immediately disclose publicly the nature and extent of the interest. The proposed ordinance states that anyone can initiate action against a commissioner by submitting a written complaint to the county clerk. Each complain will be reviewed initially by the county attorney to determine if it involves a commissioner. Complaints involving a commissioner are to be immediately forwarded to a Special Master, an attorney to be appointed by the BOC once the ordinance has passed. Complaints then move to an Ad Hoc Board of Ethics, which is appointed when a complaint that is filed is considered by the Master to have merit. All of these provisions are unchanged from the draft ordinance made public back in April. What is changed is the composition of the Ad Hoc Board of Ethics. In the ordinance now before the Commission, the Ad Hoc Board is created by the Special Master, the Oconee County Probate Judge and the Oconee County Chief magistrate after soliciting applications and recommendations from the citizens of the county. Originally, the Special Master alone made the appointments. The ordinance stipulated that the Master would solicit recommendations only from the county bar association, the state bar association, the county Chamber of Commerce, the county Board of Elections and Registration, elected county officials, and the Board of Education. Given that the Special Master was an appointment of the BOC, the BOC retained considerable control over composition of the Ad Hoc Board of Ethics. The revised ordinance dilutes that influence somewhat. The probate judge is an elected official. The magistrate court judge is appointed in Oconee County by the BOC. Other changes in the ordinance proposed back in April cleaned up the language and corrected a numbering problem. Commissioner John Daniell (above) spearheaded the efforts to create the ethics ordinance, which was drafted by County Attorney Daniel Haygood and modeled at least in part on a Draft Model Ethics Ordinance for Counties prepared by the Association County Commissioners of Georgia. Ethics had been an issue in the 2008 campaign in which Daniell defeated long-time Commissioner Don Norris. Norris, a member of the Board of Directors of North Georgia Bank, had been criticized for not recusing himself from votes involving developers doing business with the bank. The ordinance before the BOC on Sept. 28 would give citizens a mechanism for making complaints of the sort voiced against Norris and for having the complaint considered by citizens in the county. The Oconee County Cycling Organization was sent home tonight without its Share the Road signs when the Land Use and Transportation Planning Committee decided to postpone further discussion of the signage until it has information on the legal implications of telling bicyclists and motorists to ride together. The cycling organization asked the Committee back in July to recommend that the county install Share the Road signs on Colham Ferry road from Watkinsville to Watson Spring Mill road, on Simonton Bridge road from Watkinsville to the county line, on New High Shoals road from U.S. 441 to SR 186, and on Barnett Shoals road from Watkinsville to the county line. The Committee delayed discussion of the request until tonight, in part so it could ask Emil Beshara, director of the Public Works Department, his opinion of the request. Beshara left little doubt that he is not in favor of the signs, saying that he was afraid that they would indicate an endorsement by the county of biking on the roads, possibly leading to legal liability should there be an accident. Beshara stressed that bicyclists and motorists have the same right to the roadway. “Much to many people’s dismay, bicyclists have the legal right to use our roadways, just as much of a right as a car,” he said. None of the eight committee members present expressed much support for the request, and several, most prominent among them Frank Watson, were openly hostile. “I have friends who complain to me all the time about bicyclists and holding up traffic,” he said. He added that he also felt “BikeAthens has a little bit to do” with the request and he didn’t like that. Richard McSpadden, a member of the Committee and president of the OCCO, was not present, and Tony Glenn made the pitch for the signs in his absence. Glenn said OCCO selected the four roads because its members indicated they use them extensively, often to reach other roadways in the county with less traffic. The Committee will not take up the signage request again until at least November. Watson will not be on the Committee then, since his term ended tonight and he did not seek reappointment. Any action taken by the Committee would be advisory to the Board of Commissioners, which would make the final decision. In October, the Committee plans to devote its meeting to a public pitch for its recommendation that the county separate the county judicial and administrative facilities and build a new judicial facility near the county jail. The exact date for that presentation has not yet been set. The Northeast Georgia Regional Commission is scheduled to hold three meetings this coming week that will determine the kind of protection Elder Mill, Elder Mill Bridge, the Athens Line and the Apalachee River will receive as four of 25 resources identified by the Commission as regionally important. At issue is a Resource Management Plan drafted by the staff of the planning division of the Commission that asks counties to take a series of steps to preserve the resources. Oconee is one of 12 counties served by NEGRC. These steps include steering development away from these four resources, coordinating new development patterns with those of existing neighborhoods by use of compatible scale and design and preserving historic and cultural resources located on or adjacent to the sites. The draft plan will be taken up by the Planning Advisory Committee of NEGRC at its 10 a.m. to noon meeting on Monday. That meeting will be held at the E.H. Culpepper Conference Room of the NEGRC offices, 305 Research drive in Athens. A public hearing on the plan will be held at that same location from 6 to 8 p.m. on Tuesday. The plan will be submitted to the Council for consideration at its meeting on Thursday. That meeting will begin at noon at the Holiday Inn in downtown Athens. Following the decision at that meeting, the plan will go to the Georgia Department of Communication Affairs for review and comment. The Council is the governing body for NEGRC. The mill, the bridge, the rail line, which stretches from Athens to Madison and runs through Oconee County, and the river were designated unanimously as regionally important and in need of protection by the Council at its meeting on April 15. Melvin Davis, chairman of the Oconee County Board of Commissioners and a member of the NEGRC Council, expressed reservations about the inclusion of the Athens Line on the RIR list prior to the meeting, but he did not voice those reservations publicly at the meeting itself. Davis and other members of the BOC said they were worried that designation of the rail line might hamper development in Oconee County. Watkinsville Mayor Joe Walter, the municipal representative of Oconee County on the Council, voted for the Oconee County proposals as a member of the Planning Advisory Committee that screened nominations and presented the recommendation to the Council. The third Oconee County member of the Council–-designated as a citizen representative–-is Amrey Harden, president and CEO of Oconee State Bank. Though Oconee County officials could have submitted resources for possible inclusion on the RIR list, none of them did so. Tony Glenn, an avid bicyclist, submitted the Athens Line proposal, suggesting that it would be appropriate in the future for a bike trail. The Friends of Elder Mill and Elder Mill Bridge submitted the Elder Mill and Elder Mill Bridge nominations. The Athens Line was listed as a resource for all three counties. The draft plan lists 18 different activities that counties should take to preserve the Regionally Important Resources. In addition to steering development away from the resources, coordinating new development and preserving resources located nearby, the plan asks counties to encourage the redevelopment or adaptive reuse of existing buildings, to develop site plans for nearby development that are sensitive to the natural features of the site and to use low impact development practices. Every development within a mile of the Regionally Important Resource will be affected by the proposed plan. The Tuesday evening public hearing conflicts with another meeting of interest to local bicyclists. The Citizen Advisory Committee for Land Use and Transportation Planning is scheduled to discuss on Tuesday a request from the Oconee County Cycling Organization that the county install Share The Road signs on roads used by cyclists throughout the county. That meeting is to begin at 7 p.m. at the Community Center in Veterans Park. Land Map Change to Follow? The Oconee County Board of Commissioners voted 3-1 tonight to set aside the Future Development Map it approved in March of 2008 and rezone 6.2 acres on Greensboro highway just south of Watkinsville so Courtney M. (Matt) Elder Jr. can move his Oconee Waste Transport business from downtown Watkinsville. Only Commissioner Chuck Horton voted against the decision. The public hearing and discussion of the rezone request lasted two hours and included a well-organized presentation by neighbors strongly opposed to the rezone. The opponents argued that the relocation of the trash transport business was inconsistent with the county development map and with the county code and threatened the quality of their lives and value of their homes. Proponents, including Oconee County Chamber of Commerce Chairman Kenneth Mann, argued that the rezone was necessary to support a local business that contributes to the local economy. Elder threatened to move his business outside the county if he didn’t get the rezone. Elder submitted a letter from AmeriPride Services Inc. saying that his current property on Experiment Station Road is contaminated as a result of past dry cleaning activities carried out on the AmeriPride-owned property adjoining Elder’s current location. According to the letter, AmeriPride will install a groundwater extraction and treatment system on the Elder property. Land Planner Jon Williams (above during break with Elder behind), representing Elder, said at the meeting that Elder could not find any sites for his business other than the one he owned. At the meeting tonight and prior to the vote, Oconee County Planning Director B.R. White said he would recommend that the BOC change its Future Development Map if it approved the rezone since the use proposed by Elder was inconsistent with the designated uses in the area. The planning staff recommended against the rezone. The 2030 Future Development Map classifies the area as Country Estates. Areas so designated are to provide a transition from urban to more rural areas and should include estate farms or large-lot subdivisions. None of the commissioners argued that the waste transport business was consistent with the designation, with Commissioner Jim Luke joining Horton in arguing most vocally that it was not. Luke said if the vote was positive he wanted to redraw the Future Development Map to allow for more such zoning in the future. More than 100 people attended the hearing, which was moved from the usual commission chamber to a courtroom to accommodate the crowd. The vote by the BOC changed the zoning for the 6.2 acres from A-1 (Agricultural District) to O-B-P (Office Business Park District). The tract rezoned is part of a larger tract of 9.7 acres that Elder asked in 2005 be rezoned from A-1 (Agriculture District) to I (Industrial District). The BOC denied that request. Land Planner Williams tonight said Elder has no firm plans for how to use the remaining acreage but that it could be used for future expansion. He’ll have to come back for another rezone if he wants to do that, but the discussion tonight suggests the county will have changed the land use map by then to make it easy for him to do so. The Oconee County Board of Commissioners on Tuesday night is scheduled to consider a rezone request for 6.2 acres on Greensboro highway just south of Watkinsville that challenges the board’s commitment to the Future Development Map it approved in March of 2008 and its commitment to support local small businesses. Courtney M. (Matt) Elder Jr. is asking the county to rezone the land so he can move his Oconee Waste Transport business from downtown Watkinsville. Property owners in the area say the waste hauling facility will adversely affect their home values and is at odds with the pastoral landscape and land use patterns of the area. The county’s planning staff has recommended against the rezone request, saying that the “request is not compatible with the land uses or zoning classifications of neighboring properties” and “does not meet the guiding principles, policies, development strategies” of the county land use map. The Planning Commission voted Aug. 16, by a vote of 4-3, to recommend to the BOC that it approve the change requested by Elder from A-1 (Agricultural District) to O-B-P (Office Business Park District). A majority of the four Planning Commission members representing the unincorporated parts of the county actually voted against the resolution. George Rodrigues, who made the motion, represents Watkinsville on the commission, and Karl Berg, who seconded it, represents North High Shoals. Bruce MacPherson, representing Bishop, joined Rodrigues and Berg and county representative Mike Floyd in voting for the resolution. Chuck Hunt, Bill Ramsey and Chuck Steen, all representing the unincorporated parts of the county, voted against the rezone request. Vice Chair Bill Yarbrough did not vote. David Camp, representing Bogart, the county’s fourth city, was not present. Travis Marshall, Penny Mills and Chairman Dan Arnold also were absent. The final decision is scheduled to be made by the BOC at its 7 p.m. meeting at the courthouse on Tuesday night. The request the board will be considering is a redraft of one turned down by the Planning Commission by a vote of 5-3 on July 18, 2005. Yarbrough, Ramsey, Arnold, McPherson and then member Jim Butler voted for the denial. The BOC also voted on Aug. 2, 2005, to deny the rezone. Current board members Margaret Hale, Chuck Horton and Jim Luke joined then member Don Norris in voting unanimously for the denial. John Daniell was not on the board at that time. In 2005, Elder asked to rezone 9.7 acres from A-1 (Agriculture District) to I (Industrial District) to develop a waste transfer station. The planning staff concluded that the zoning was out of character with the area and that zoning to industrial “would constitute a spot zoning of the area.” The staff report also said that the rezone was not consistent with development trends in the area or with the land use plan in effect at the time. The current request uses only 6.2 of the total 9.7 acre-tract (at end of slide show) and is for a “solid waste collection company office facility” rather than for a waste transfer station. The selected acreage is the northern part of the total tract. The proposal does not specify what is planned for the remaining acreage. The proposal calls for construction of a 15,900 square-foot building and a 750 square-foot pole barn. It also calls for parking area for collection trucks and an area for storage of waste collection containers. The site would include buffers to hide it from surrounding properties. “The proposed solid waste collection company office could negatively impact neighboring residential property values,” the staff report stated. The staff said if its recommendation for a denial of the rezone request was not accepted, approval should be with nine conditions. The Planning Commission, in recommending the rezone, modified two of those conditions. The staff had said that no overnight storage of waste should be allowed. The Planning Commission resolution passed stipulated that only construction and demolition waste could be stored on the site and only overnight or over a weekend. The Planning Commission resolution expanded the allowed hours of business from the staff recommendation of 7:30 to 5 p.m. on weekdays and 9 a.m. to 4 p.m. on Saturdays to 6 a.m. to 6:30 p.m. on weekdays and 9 a.m. to 4 p.m. on Saturdays. At the Planning Commission meeting on Aug. 16, Jon Williams from Williams & Associates, a land planning company representing Elder on the rezone, submitted a 60-page rebuttal to the staff report. Included was a statement by Rusty Haygood, Oconee County economic development director, estimating total annual economic impact of Oconee Waste Transport of $1.3 million on the county’s economy. Elder said he will have to move the business out of the county unless he gets the requested rezone because he is being forced to leave his current location (at front of slide show) and cannot find an alternative site. Williams of Williams & Associates told the Planning Commission that the current site is contaminated and must be abandoned but the problem is not because of the operation of Oconee Waste Transport. According to the submitted Zoning Impact Analysis, the Future Development Map should be treated only as “a guide” for future development, “current trends in the area have been predominately toward commercial growth,” and the project is located on a major traffic artery make the site appropriate for development. Both OWT and the planning staff agree that the Future Development Map designates the area as for low-intensity residential community development that is “reminiscent of a rural environment” and serves as a transition to the part of the county to be preserved as rural and for agriculture. The site is only about three-tenths of a mile south of the Watkinsville city line and its industrial area. On Aug. 5, 2008, the Board of Commissioners voted to deny a rezoning request from planning commission member Travis Marshall for a subdivision about a mile south of the Elder site on the grounds that it was inconsistent with the Future Development Map. The county successfully defended that decision in court after Marshall filed suit against the county for denying the rezone. Commissioners Horton and Luke voted against the rezone request by Marshall. Commissioner Hale was absent, and Commissioner Norris voted in favor. The Oconee Waste Transport rezone request in 2005 and the one this year have produced vocal opposition from residents in the area. Residents have turned in petition in opposition to the current rezone request signed by more than 150 people. In addition, someone dropped off at the Planning Department office a seven-page document that included, among other things, pictures of the current Oconee Waste Transport site on Experiment Station Road opposite the Watkinsville Post Office. The planning staff forwarded the document from the unidentified person to the members of the Planning Commission, producing an email response from BOC Chairman Melvin Davis. Alan Theriault, county administrative officer, disagreed. The email exchange is part of the Elder rezone file in the Planning Department. I came across it when I reviewed that file on Aug. 20. 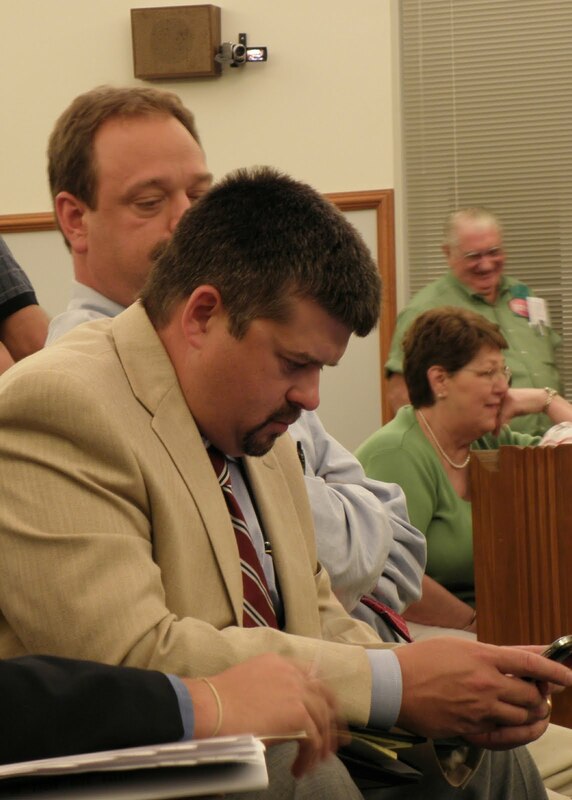 Davis attended the Planning Commission meeting on Aug. 16, as did Commissioner Horton. Davis will vote on the rezone only in the case of a tie vote among the four other commissioners. The rezone request has generated considerable interest in the development community. Chuck Williams, president of North Georgia Bank and chair of the county’s Industrial Development Authority, was present at the Planning Commission meeting on Aug. 16, as was local businessman and developer Mike Power. Neither spoke, but L.C. Givens, owner of Outdoor Speciality in Watkinsville, and local developer Tom Little did. Both criticized the commission, assuming it was going to vote against the rezone. About 40 people attended the Aug. 16 Planning Commission meeting, and eight citizens spoke in opposition to the rezone. At a Town Hall meeting held by the BOC on June 10, Chuck Williams from the development authority and Elder asked questions that anticipated the Oconee Waste Transport rezone request, which was submitted in July. Williams asked how the board members would accommodate what he called “blue collar businesses” such as Elder’s waste hauling business when neighbors don’t want them nearby. Elder followed Williams at that meeting by asking the commissioners more specifically where they would be willing to locate industrial sites. Horton said he would look first at property adjacent to where these activities currently exist and also along the U.S. 78 corridor. Hale said she would look at where current infrastructure exits and mentioned areas along U.S. 78 and U.S. 441. She said she also would consider some properties along SR 316. The site Elder is seeking to rezone does have county water, but not county sewage treatment. Elder proposes to handle water treatment via a septic system. What the site certainly does have is a small subdivision very near to it. The subdivision is question is known as Bell’s and is on Maple lane and Maple circle off Greene Ferry road. Tax records show that of the four houses that are on properties that abut the full 9.7-acre tract (the northern part of which is under consideration for rezone), the first was built in 1966. The others were built in 1972, 1973 and 1983. Ramsey said his concern was what the residents would see of the Oconee Waste Transport facility. Jon Williams said they would be protected because of the buffers. As a letter in today’s Athens Banner-Herald makes clear, at least some residents of the subdivision disagree. The full video of the Planning Commissioner meeting is on the Oconee County Observations Vimeo site. The Oconee County Board of Education spent an hour tonight interviewing the three applicants for its open Post 5 position, tossing them a series of questions on such topics as the responsibility of the board, perceived strengths and weaknesses of the school system and how the board members should handle complaints from the public. Applicants Wayne Bagley, Michael Burnette and Glenn Townsend, seated at a table in front of the board members, answered the questions in rotation, and they gave mostly similar answers to the questions posed. Bagley, a vice president of development for Lassiter Properties, made reference to his experience on the Oconee County Citizen Advisory Committee for Land Use and Transportation Planning in response to several of the questions to indicate his familiarity with local governmental issues. Burnette repeatedly made reference to his experience as a businessman. He is an area manager for Tires Plus. Townsend, a retired teacher and administrator in the Oconee County system, stressed his knowledge of the system and of educational issues generally. The applicants recognized that the Board of Education sets policy, but it does not run the schools day-to-day. They also said that complaints from the public should be directed to the school administration and that board members should not get involved. Candidates were given three minutes to answer questions, which board members took turns in asking. “I’m going to have to say it is the community,” Townsend said. “I think it is the students,” Bagley said. “The teacher-parent communication is something that I think could use a little help,” Bagley said. “Just like in business when you have high performers and low performers, the low performers are the ones that get the most attention,” Burnette said. He said all students need to be given attention. Near the end of the interview session, board member Mack Guest asked each applicant to indicate what he would cut if the school budget needed to be trimmed more. Bagley said he didn’t know what he would cut, but he would protect the teachers. Burnette said he would look for whatever did not affect the classroom. Townsend said he would focus on such things as lights that didn’t need to be on, travel that was not necessary and ways to make the bus system more efficient. Only about 20 people attended the session, which was held at the superintendent’s office in Watkinsville. The Post 5 position became vacant in May when Tom Breedlove resigned and moved out of the county. Seventeen citizens applied for the opening, and the three candidates interviewed have been selected by the board as the finalists. Board Chairman David Weeks said after the meeting tonight that he expected the board to make its decision on Breedlove’s replacement by October. The full video from the meeting is on the Oconee County Observations Channel of Vimeo.